7 sin falta, 4 sin ninguna penalidad en el desempate, 12.550€ el ganador, diseño del italiano Elio Travagliati. The second week of the Spring MET I 2019 concluded on Sunday with the CSI3* 1.50m Grand Prix presented by CHG (Construcciones Hispano Germanas S.A).The course set by the Italian mastermind Elio Travagliati counted 13 obstacles and 16 efforts in the first round, with the time allowed set to 77 seconds. The time allowed definitely played a part with some of the best riders in the world missing out on the jump-off by the tiniest of margins. 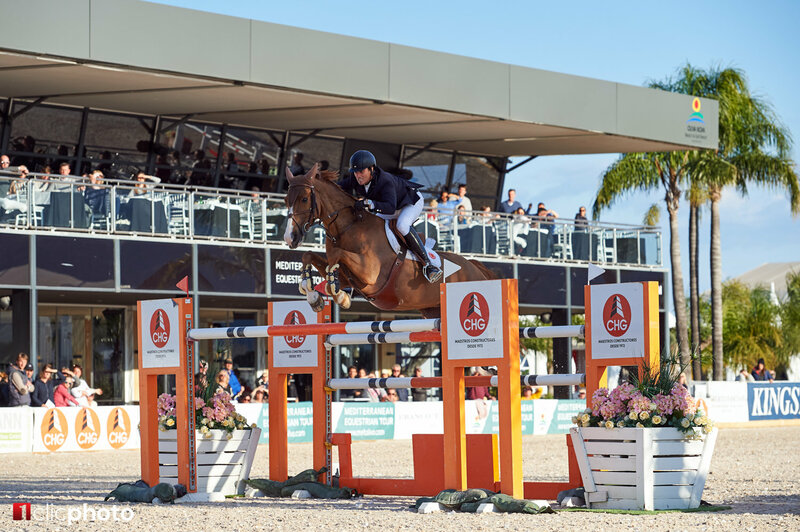 The 60 best horse-and-rider combinations from Thursday and Friday had qualified for the Grand Prix, but it was only seven pairs that cleared the demanding first round and could join the deciding jump-off over a shortened, nine fence track. Gregory Wathelet (BEL), Holger Wenz (GER), Marlon Modolo Zanotelli (BRA) and Vincent Voorn (NED) all had to settle to the sidelines, after leaving the fences intact but fractions too slow. Lance Whitehouse (GBR) on the 17-year-old gelding Vik II (Cantos x Unknown), Alice Trehoust (FRA) on the 10-year-old gelding Vertigo du Desert (Mylord Carthago x Robin II Z), Pedro Veniss (BRA) on the 14-year-old mare For Felicila (For Pleasure x Espri) and Valentine Belooussoff (FRA) on the 12-year-old gelding Calou (Roven x Lauriston) all cleared the first round and joined Samantha McIntosh (NZL) on the 16-year-old stallion Check In 2 (Böckmann’s Cordalme Z x Lord Pezi), Riccardo Pisani (ITA) on the 10-year-old gelding Cristo 28 (Cornado I x Stakkato) and David Will (GER) on the 13-year-old gelding Forest Gump 29 (Forsyth x Feuerwerk) in the jump-off. For a while it looked like the young French talent Valentine Belooussoff would take the win, but as last to go Pedro Veniss pushed her into second place – crossing the finish line in 42.35 seconds, taking home the top honors. Samantha McIntosh on Check In 2 took the third place and Riccardo Pisani on Cristo 28 placed fourth, after jumping double clear rounds. David Will and Forest Gump 29 clocked the quickest time of the day, but had to settle for the fifth place after the very last fence fell in the jump-off – resulting in four penalties. “It was a very technical course, a really good job from the course designer today,” Veniss said afterwards. “Seven clears were perfect for the jump-off, and I am very happy with my horse,” he continued. “For Felicila has been super here; she was second during the first week and won today, so she has started the year very good,” Veniss praised his winning partner. On the new surface in the main ring Oliva Nova, Veniss said: “It has been a big change, but I think all the horses jumped super and the future looks great!”“I think everything here is really nice for both horses and riders, I always enjoy my time here Oliva,” Veniss concluded.Runner-up Belooussoff said: “The time was short, so we had to go a little bit fast. It was a good Grand Prix, a course we had to ride very carefully. This is my biggest achievement yet!”The Spring MET 2019 now takes a short break, before it resumes with its second part on the 5th of February running until the 24th of February – followed by MET III in March and MET IV in April. Click here for full results.